Philadelphia Flyers centre Sean Couturier is out four weeks after suffering a knee injury for the second time in five months. Couturier set career highs with 31 goals, 45 assists and 76 points last season. 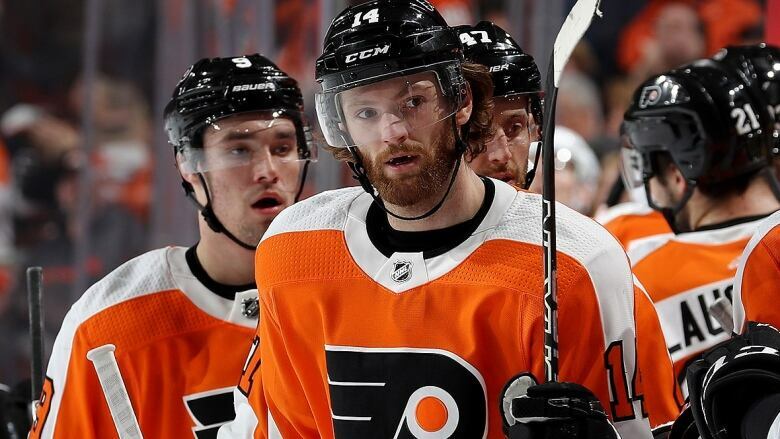 Philadelphia Flyers centre Sean Couturier is out four weeks after injuring his knee for the second time in five months. General manager Ron Hextall said Wednesday that Couturier was injured Aug. 10 during an off-season exhibition game. Hextall expects Couturier to be a limited participant in training camp when the Flyers get on the ice Sept. 14 and for the 25-year-old to be full-go halfway in and play in some preseason games. Dancing around specific details, Hextall would only say the injury was not in the exact same spot as when Couturier damaged the medial collateral ligament in his right knee during the playoffs when he collided with teammate Radko Gudas in practice. "It's not a re-injury," Hextall said on a conference call. "He was 100 per cent at the time, had more than enough time to heal after the season." Couturier was playing in the summer Boot Camp Tournament in Quebec City when the latest injury happened. Hextall called it a "freak" accident, which similarly describes the knee-on-knee collision with Gudas in April. "He was participating in a game, kind of an innocent play, and things happen," Hextall said. "It was just kind of a play in front of the net and it was a rebound and his leg just went the wrong way." Hextall said the team has no plans to forbid players from participating in summer leagues or tournaments. "We want our guys to train hard and train the proper way, but you see guys on other teams getting hurt literally training," Hextall said. "They do train hard and there is some risk every day." The Edmonton Oilers recently announced that defenceman Andrej Sekera was out indefinitely after having surgery on an Achilles tendon torn during off-season training. Hextall said Couturier would not require surgery, as was the case with his previous knee injury. Couturier is coming off a breakout season in which he was promoted to Philadelphia's No. 1 centre and set career highs with 31 goals, 45 assists and 76 points. He was third on the team in scoring and finished second in voting for the Selke Trophy as the NHL's best defensive forward. His injury isn't expected to alter the Flyers' plans to keep captain Claude Giroux at left wing after he flourished there last season playing on a line with Couturier. Hextall also isn't concerned about Couturier being more susceptible to knee injuries moving forward. "This type of injury heals fairly quickly and fairly well," Hextall said. "I don't anticipate this being an issue."